A personal coach, monk, lifestyle & motivational strategist, sharing deeper spiritual insights with the world. Gaur Gopal Das is an Electrical Engineer, having studied at the College Of Engineering, Pune. After a brief stint with Hewlett Packard, he decided to upgrade his career to be a life style counsellor. Consequently in the year 1996 he joined ISKCON & has been very active in this field ever since. 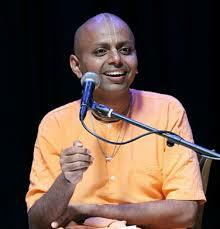 Serving in the leadership at the ISKCON , Gaur Gopal Das has also been speaking at various prestigious colleges like VJTI, ICT and TNMC for nearing 2 decades. He has been very actively involved in guiding leading doctors & medical professionals at the Breach Candy, Jaslok, Kokilaben Ambani & Bhaktivedanta Hospitals. Has spoken as the keynote speaker along with Shammi Kapoor & Shatrughna Sinha at the "World Kidney Day" function at Ravindra Natya Mandir on several occasions. Corporate firms like Infosys, Barclays, E&Y, Macintosh Inc have not been an exception in his areas of continual help & guidance. In fact the seminar entitled "A Monk who bought his Ferrari" that he did at Ernst & Young, London drew great appreciation. As Gaur Gopal Das regularly visits the members of the Rotary Club & Lions Club for talks and guides various top ranking celebrities and corporate leaders, he also extensively travels across the globe try to add value to human society. He has penned 3 books entitled, "Revival", "Conquest" and "Checkmate"
He has lectured extensively throughout India, including the top educational and business institutions. Over the past 10 years, he has also been regularly travelling to the UK and Europe in order to deliver lectures and seminar on varying aspects of Vedic Culture and Krsna consciousness, wowing his audiences with his unique mix of deep knowledge and witty humour. "To book Gaur Gopal Das as the speaker for your event simply complete the online form. For more information regarding any of the Motivational Speaker on our roster contact Simply Life India Speakers Bureau on +91 8652835000 or speakers@simplylifeindia.com"